EDITION IS LIMITED TO ONLY 313! This edition is limited to only 313 in the world! +++ Beauty and the Beast Falling in Love is the thirtieth film in the Walt Disney Animated Classics series, Beauty and the Beast is considered one of Disney's greatest animated films. ++ Was created with a blend of both traditional and computer animation. ++ Was the first animated film to be nominated for an Academy Award for Best Picture. +++ Thom presents the entire movie in one dramatic narrative panorama. 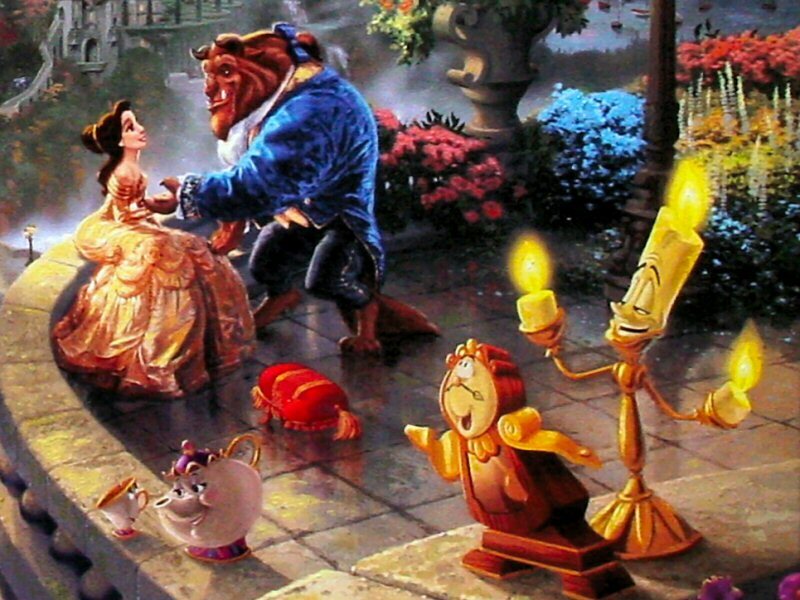 +++ Characters from other Disney Dreams Collection paintings are hidden in Beauty and the Beast. +++ Thom has hidden 7 hearts in the painting. +++ The flying machine portrayed in the painting was imagined by Thom as being an invention of Belle�s father Maurice. +++ Beauty and the Beast Falling in Love sixth painting in the Disney Dreams Collection. 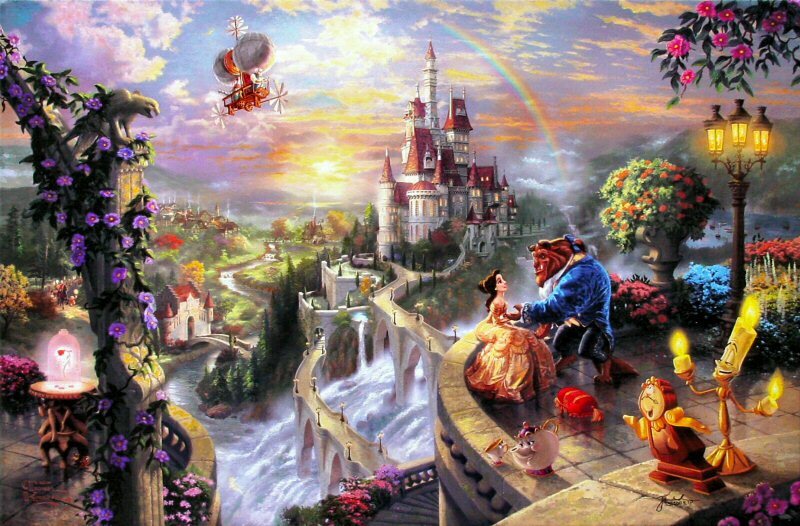 Beauty and the Beast Falling in Love is the sixth painting in Thomas Kinkade's new Disney series entitled Disney Dreams. ++++ Rare! This Edition is Limited to only 313 in the world! 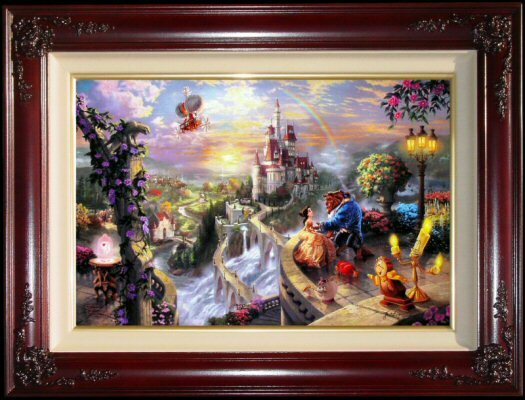 ++++ Brass Plaque with the legend "Beauty and the Beast Falling in Love ~~Thomas Kinkade"
International Gallery Proof (S/N) Canvas Standard Numbered and Signed & Numbered Canvas Lithograph Limits vary by release. Individually Hand Highlighted with oil paint. The artist's authorized security signature featuring DNA technology. Individually hand numbered. Corresponding Certificate of Authenticity. 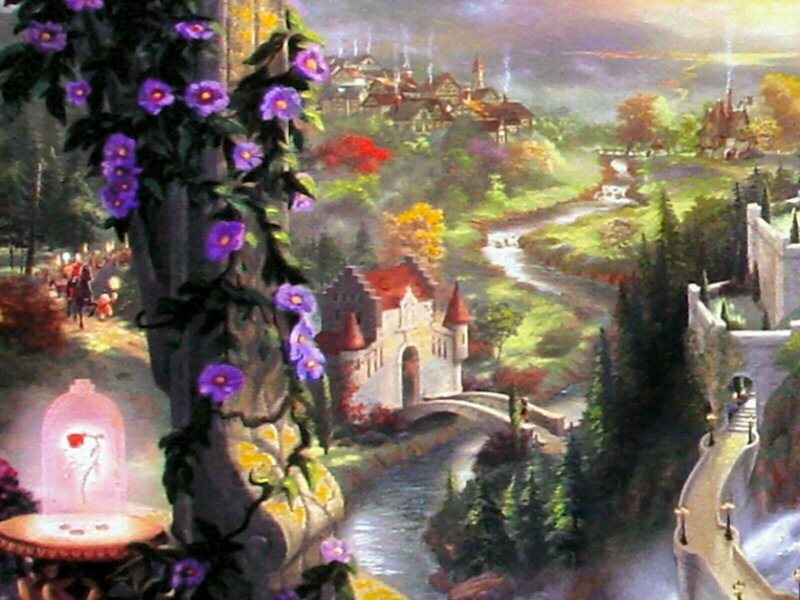 Before May 1997 the Signed & Numbered and A/P,G/P and P/P were ALL personally hand signed by Thomas Kinkade. "Of all the Disney love stories, Beauty and the Beast is perhaps the most poignant. Beast�s true identity is a charming prince who is discovering love in the form of the beautiful Belle. In my painting, I memorialize that magic moment when they first begin to discover their love for each other. 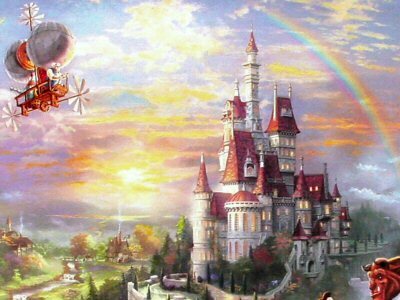 Many of the characters from the movie are present, including Belle�s father, Maurice - an eccentric inventor who soars overhead in his homemade flyying machine. In the distance, we see the village that is a central setting for many of the film�s most important moments. At lower left, we see the evil Gaston leading his parade of angry townspeople in search of the Beast. As in the movie, the wonderful characters of Cogsworth, Mrs. Potts, and of course, Lumiere, feature prominently in the foreground. As with every piece in my Disney Dreams Collection, I attempted to portray a panorama of the entire movie, rather than an individual scene. My desire is that the viewer�s eye would wander around the painting making discoveries in every corner of the image. A tradition in my Disney Dreams Collection is hiding characters from earlier paintings in the current piece and Beauty and the Beast Falling in Love is no exception. See if you can find Snow White, Tinker Bell, the mice from Cinderella, Pinocchio, and if you look carefully you�ll even see Bambi cautiously creeping around the corner of some foliage in the distance below the Castle. Beauty and the Beast Falling in Love represents, in my mind, my highest accomplishment so far in the Disney Dreams Collection. It is filled with detail�all encompassing over 600 hours of studio time. The crowning achievement and the central discovery in the image is the sweeping sense of romance that is at the core of the Beauty and the Beast fairy tale. Here truly is unconditional love in its purest form. I hope you sense that love every time you look upon Beauty and the Beast Falling in Love."